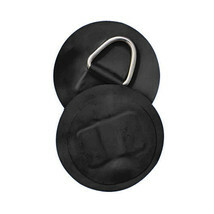 Stainless steel D-ring on PVC patch for inflatable boats . The same good strong quality fabric & patches that are on inflatable boats . 15 CM ACROSS ROUND PATCH Used for rescue rope,bailer, cargo, thigh straps . Available in Gray and Black color .